The World Series features the best players in the world going after one of the most prestigious prizes in all of sports. Only about 700 men are blessed with enough talent to even have the slightest reason to believe that their Fall Classic dreams can become a reality. For AJ Burnett and the Yankees last night, reality got a little better, as they won Game 2. I am sure it was sweet as sugar. 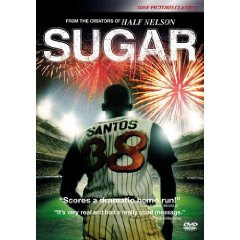 Sugar is also the name of a feature film that looks at the other side of the pro-baseball spectrum: the guys who never make it past rookie and A ball. I've been wanting to see this movie ever since it came out last year. This week I finally got the opportunity. I'm so glad I did. If you haven't seen it yet, go out and buy the DVD, set aside some time and watch it. It is a deeply moving film which focuses specifically on Latino ballplayers doing whatever they can to get out of the poverty they are stuck in back in their home countries. Even if you haven't seen it, you probably know the synopsis; MLB was heavily involved in the marketing of the film last year and promoted it at MLB.com. In case you forgot, Algenis Perez Soto (a non-actor) does a very good job of portraying Miguel "Sugar" Santos, a Dominican pitcher trying to move up in the fictional Kansas City Knights organization. In the film you see Sugar going through culture shock, struggling to learn English (He eats lots of french toast because it's the only food he knows how to order in English), and just trying to stick in Single A. You see his friends and teammates dealing with struggles of their own and both they and Sugar discover the pros and cons of socializing with American women. Sugar is not the best movie ever made, but it is definitely one of the most important movies ever made. I can't recommend it too much. It's available at Amazon.com. Enjoy. I still haven't seen Sugar, but last night's game was sweet. I loved Sugar and I'm glad you got a chance to see it. I think it painted a very accurate picture of what it must be like for these guys who come over and have to fit in to "make it" and all the pressure they must feel. Loved the ending. After screaming for countless hours after the Yankees won, I came to sad conclusion that Yankees Memorabilia is worth more than my stock.